Bona fide staff members, their biological children or spouse who had PUTME score of 180 and above and average score of 200 and above and have not been admitted as published earlier are invited to complete Staff Request Form. 1) Visit the University of Nigeria website (www.unn.edu.ng) or portal (unnportal.edu.ng), log in your child/spouse’s JAMB Registration number to generate and download a Payment Invoice which contains a Remita number, the invoice will enable you to make payment at any Commercial Bank. 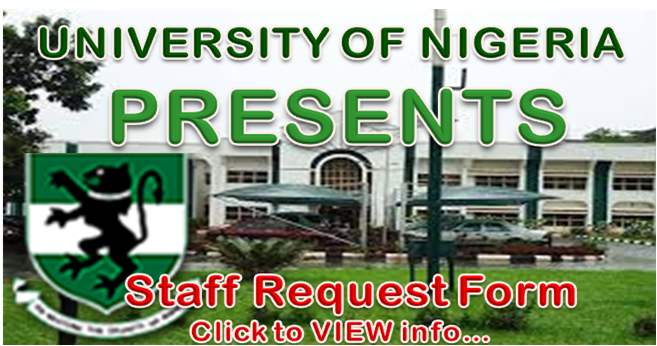 3) Visit the University of Nigeria website (www.unn.edu.ng) or portal (unnportal.edu.ng) again and login the JAMB Registration Number, the Confirmation Number and Invoice Number, then print the Staff Request form and complete it, countersigned by relevant authorities as indicated in the form.